My Mother has always told me to wash my hair every 3 or 4 days in order to keep it healthy, and that has been my normal routine ever since I was a little girl. Sometimes I will bring that up to my friends, who will comment on how disgusting that routine is. I have been told by many people that I need to wash my hair everyday, because otherwise it is gross and unsanitary. After interviewing 10 college girls on this situation, I have found extremely mixed answers on how frequent hair should be washed. This leads me to believe that people are not educated how often they should wash their hair, and what is acceptable. So what is the truth, how often do we really need to wash our hair in order to keep it the healthiest? Unhealthy hair has many causes. Many people take care of their hair poorly, and do not even realize the consequences of their actions in the present moment. According to the article, 8 Ways You’re Damaging Your Hair, people damage their hair by: bleaching, perms, color, heat (straight irons and curling irons), ponytails, over-brushing, over-shampooing, and extensions. This video demonstrates one of the 8 ways, and how a curling iron can be of much harm. The process that most people follow in personal hair-washing care is first using shampoo, followed by a conditioner treatment. It may seem like a simple, painless routine that most people do not think about in the moment, but many do not realize the products that they are actually putting in their hair. To start off, shampoo is a product designed to clean and maintain hair healthiness. It helps remove dirt and soil, and then conditions the hair. 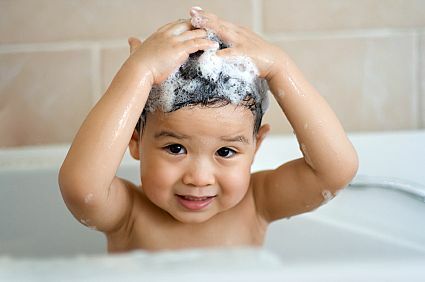 The cleaning and lathering process is usually achieved from two distinct types of ingredients; surfactants and conditioning agents (How do Shampoos Work?). 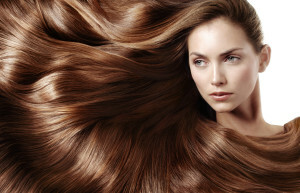 Surfactants are the main source of how hair is cleansed. These compounds make up a final detergent of a solution product, which in this scenario, is the shampoo itself. Surfactants function by breaking down the interface between water, oils, and dirt (The Essential Chemical Industry). Conditioning agents are the second type of ingredient used in shampoo. They normally include silicones and fatty alcohols in their makeup. Silicones are well known for their lubricious properties that help lather hair, making it easier to detangle (How do Shampoos Work?). Looking at shampoo ingredients, one may think that they are great for the health of hair, and should be used in large and plentiful amounts. However, research does not agree with that. Angela Lamb, an assistant professor of dermatology at the Icahn School of Medicine at Mount Sinai in New York City says, “Shampoo traps oils, so if you shampoo too frequently, you may dry your hair out, leaving it prone to breakage. Hair produces a natural oil called sebum, and shampoo rinses that out” (WebMD). Hair naturally contains many natural oils which are needed in order to have healthy hair. Using too much shampoo can ultimately damage hair, which is opposite from the result intended. In addition to using too much product, washing hair too frequently can lessen the production of these oils, and therefore, kill hair follicles. Over-shampooing is the most common way to damage hair, and most people do not realize they are doing so. “The less vigorous you are in washing your hair, the less damage you’ll do to the cuticle,” says Paradi Mirmirani, a staff dermatologist at the Permanente Medical Group in Vallejo, Calif (8 Ways You’re Damaging Your Hair). Overall, it is important to find a washing style that not only can be worked into your routine, but will also keep your hair healthy. Some products, like scalp brushes, have been developed in order to help aid people in finding a balance of pressure. After applying shampoo to the hair, the brush can be used to help work the foamy formula through hair strands. These brushes are developed to focus especially on the grease-prone areas of the scalp (Marie Claire). By getting into these deep areas, healthy hair growth is being promoted. Conditioner is the second half to personal hair management. This product contains 5 main ingredients that are beneficial for healthy hair-care: cationic surfactants and polymers, oils, humectants, silicones, and proteins. Cationic surfactants and polymers are compounds that stick to the surface of the hair. Essentially, sticking to the surface provides a layer of lubrication that helps detangle the hair, and allow for softness. Oils are also in the lubrication coating. Their slippery nature helps conceal the moisture in the strands themselves, and can provide a shiny look. Not only are they extremely healthy for hair, but they can provide protection from damage. Humectants attract water to hair. This acts in the prevention of loss of previous natural moistures. Silicones coat the hair in a thin, glossy film which is slippery and, and also helps protect against damage from things such as heat exposure. Finally, conditioners contain proteins. These help coat the hair, and repair it if necessary from damages (What’s in Conditioner?). There are many benefits to conditioner that many people do not realize; shampoo only cleanses hair, while a conditioner provides compounds, which protect and beautify the hair. It is imperative to use both products in order to provide for the best possible outcome and look. Conditioners bring out the healthy parts of the hair shaft, which can provide visible benefits such as shine and hold. Protecting the hair root and maintaining healthiness is extremely important to react to the shampoo, which takes out the natural oils in its process (What is a Conditioner?). In addition, conditioner calms down hair, and acts in preventing it from becoming frizzy. This makes it easier to style, as well as to manage. How do people learn how long they should go without doing a shampoo and conditioning process? Overall, experts agree that “only a small group of people need to shampoo daily, those with very fine hair, people who exercises a lot (and sweat), and people who live in a very humid place. The thicker the hair someone may have and the less natural oil they produce, the less they need to shampoo.” For the average person, every other day, or every 2 to 3 days, without washing is generally fine. “If it’s day five and your style is falling apart, wash it. Otherwise, do something fun to change it up. Part your hair in a different place, go for a side braid, go for a bun. Use dry shampoo. If you can camouflage, great, and often you get the most compliments when you do something different” (WebMD). What is most important to realize is that there is no definitive answer to this question, as shown by research so far, but it is important to experiment with your hair specifically in order to showcase your healthiest look possible. This entry was posted in Uncategorized on October 20, 2015 by Nancy Hilary Berman. This is a great post! I have struggled with this issue about how often I should wash my hair. I feel the need to wash it every day because my hair gets extremely greasy within 24 hours. I have tried to go a few days without washing it, but it ends up looking and feeling dirty. You mentioned that people with fine hair need to wash it more often than people with thicker hair. Do you think that the specific products and brands that people use to wash and condition their hair also has an impact? I have heard that using the same shampoo and conditioner every time you wash your hair forces it to be more greasy. Maybe certain brands create better products? Or switching up what products you use helps eliminate grease? Wonderful article. As you said, many people are not knowledgeable when it comes to washing their hair. I found it compelling how you added the purpose of shampoo and conditioner. If one wanted to take this blog into a slightly different direction, they could argue on whether one should use hot or cold water when washing their hair. Here’s a link to a website that provides the pros and cons to each side. The conclusion to the article was that most girls should use warm water instead of hot when shampooing and conditioning. This was a very interesting article, as my mom has also constantly told me to not wash my hair everyday. Therefore I have always taken her advice, and settled on washing my hair every other day unless there was any special circumstance. I never knew entirely what shampoo was, besides that all it really did was clean and that it is arguably not needed every time you wash your hair. Your article finally confirmed that for me, because some people I told that to did not agree! Although you said nothing but great things about conditioner, I wonder if using conditioner really actually has that many benefits. According to this article conditioning does nothing to improve the health of your hair, even though it may appear that way. I wonder if there are any experiments done to confirm that fact.